Australian sculptor Emily Floyd recently worked with Brisbane based public art fabricators, UAP on a privately commissioned sculpture. The work, titled Poll, was fabricated using advanced manufacturing technologies—including a Kuka six axis robotic arm. 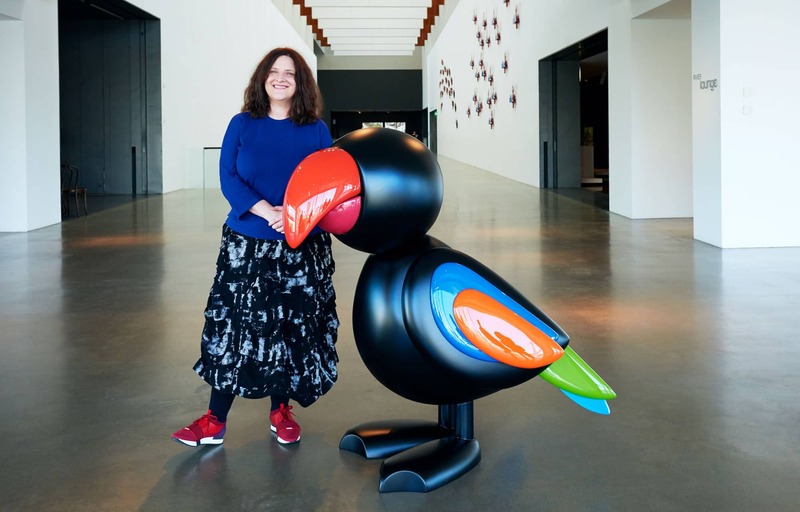 Emily Floyd’s sculpture, Poll, (pictured below) is a parrot named after a literary character in Daniel Defoe’s Robinson Crusoe. Poll stands at 1.4 metres tall and is made from 18 different pieces. The body of the parrot is black and there are six colours for the wings, tail, and beak. It is the first in a series of five ‘literary’ parrots. They are made by combining Floyd’s traditional hand-carving techniques with advanced manufacturing technologies. Floyd, who draws from a family background in toy making, creates handmade scaled models of her sculptures—these models are often referred to as ‘maquettes’. This process meant her work was ideal for advanced manufacturing processes. Floyd’s maquette for Poll was digitally scanned and then scaled up to full size using 3D modelling software. 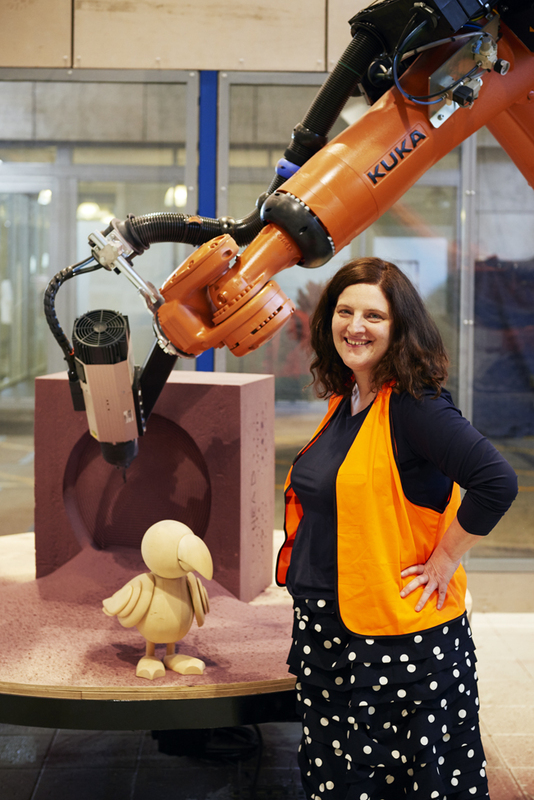 From this digital model, the Kuka six axis robotic arm cut a mould from compressed blocks of sand. The sand moulds were then used by fabricators in UAP’s workshop to cast each of the pieces out of aluminium for the sculpture. In an interview Floyd spoke enthusiastically about the sophisticated capabilities of robots and how this positively affected the fabrication of her sculpture. She said that, ‘it can make so many more decisions than an artist can, make them really quickly. Thousands of decisions all at once, even about that surface and how to cut it, how to smooth it.’ Robots are not replacing the handmade, rather they help makers to achieve a higher level of accuracy. Experimenting with Robots earlier in the creative process. Clearly, the challenge is set, to make advanced manufacturing technology more available to artists, small scale designers, artisans, and other creatives. Encouraging opportunities for experimentation with technology in creative pursuits has the potential to lead on to greater innovation for creative Australian enterprises. The advantages of incorporating robots into large scale, mass production in the Australian manufacturing sector are already known. The potential payback for smaller scale, bespoke manufacturing—businesses such as UAP—look just as promising. This is especially in terms of manufacturing costs and maintaining these businesses onshore. Floyd’s reflections on working with advanced manufacturing to create her sculpture Poll, highlight two important points. Firstly, the need for easier access to robotics and digital fabrication technology for the creative industries. This will encourage greater experimentation, leading to the potential benefits of these technologies for artistic, design and creative making processes. Secondly, Floyd identifies the decline of small scale bespoke manufacturing businesses in Australia, despite there being a demand for their services. The utilization of advanced manufacturing by these businesses has the potential to revive Australia’s small scale and artisan manufacturers.